Now the next part of the instructions suggest you practice before proceeding. And quite right too. Following on from the Crosshead/Slidebar saga we are now going to make the various bits of motion. To be fair, the D49/2 is the easiest option as the valvegear is just .3mm wire and the various linkages and rocking bits are missed out. However I still need to solder some joints; initially the crosshead to the connecting rods. The connecting rods are a simple double-up and sweat together etch. I was careful not to get solder near the rod ends as these subsequently need to be free on a joint soldered to another piece. 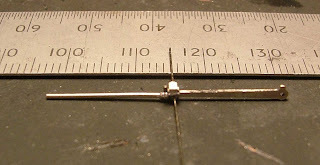 A piece of .3mm wire is held in the vice and the components are slotted on. 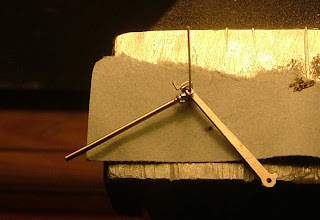 The instructions suggest a piece of oiled paper (fag paper) is inserted between the back of the crosshead (which is where solder will be applied) and the connecting rod (where it shouldn't!). It proved beyond me to thread the said piece of paper over the wire; bear in mind that the crosshead is already on the wire by virtue of the hole at the back (out of sight). So I cut a slot in a piece, oiled it, and then slid it into place. Worked a treat! Before getting too keen with the soldering iron, check the connecting rod will move freely in the unsoldered joint. There is next to no space in this tiny joint and I had to file the outer circumference of the con rod hole to get clearance. 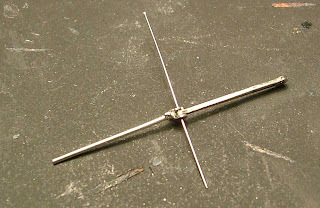 After soldering, the assembly can be removed from the vice and the wire trimmed. I think the instructions indicate that the crosshead should be in the slidebars by now. However, I found the two easy to assemble and disassemble even in their bent-up state. Doing this joint with the slidebar flapping around too would have been a nightmare. One down, one to go. We might have wheels on before New Year at this rate!